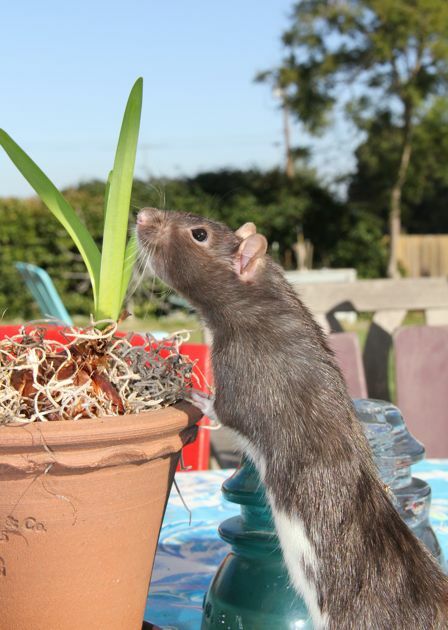 As noted, it's high time Lillian Virginia Mountweazel, Weazie Ratty-Rat, has a post of her own. 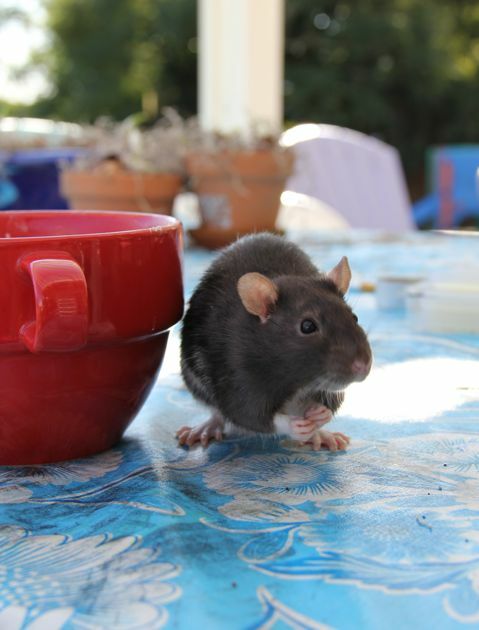 And so I bring you Weazie in the Garden, with Tea. 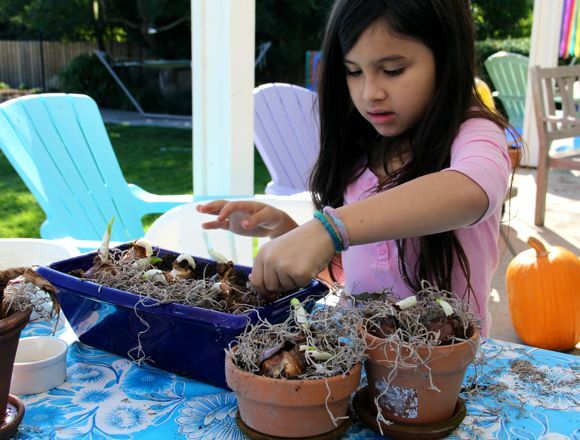 On a blue sky November day, I gathered empty pots, and a bag of bulbs, and decided to share planting paper whites with Maria. From her cozy home, we saw Weazie, watching us with an expression that clearly read, Oh, do please let me help. 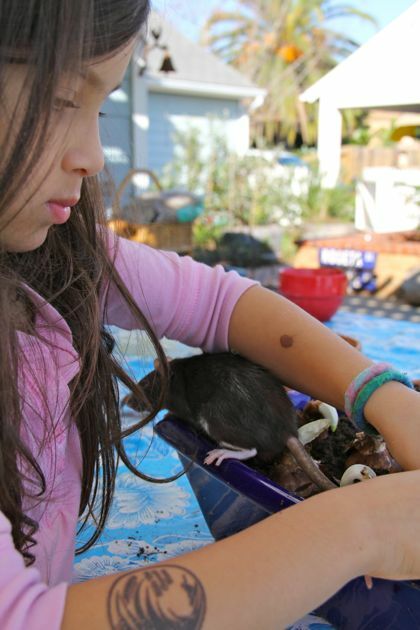 Out came Weazie, and she went straight to work, helping to gently tamp down the soil, and count bulbs. "Don't nibble, Weazie," we gently reminded. 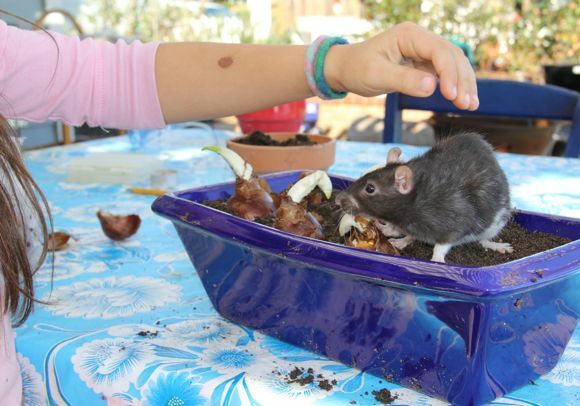 She never nibbles anything but carrots and other suitable ingestibles, but we wanted to be sure she did not sample the bulbs. Maria was enthralled... brown, papery clumps were sprouting? They will become dainty, white flowers on long graceful stems? Weazie was delighted too, with her work, and the perfect sunlit day. 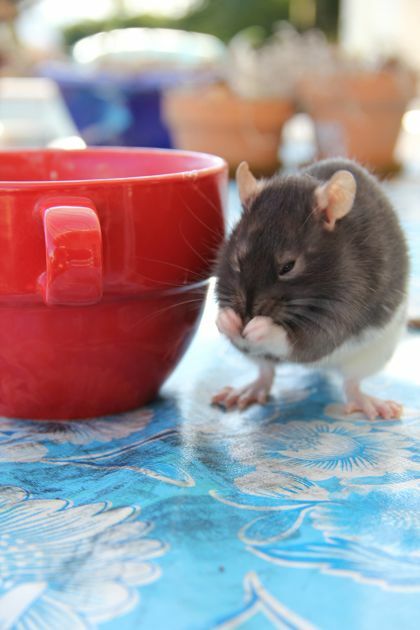 She scurried about sniffing, counting, tending each pot. 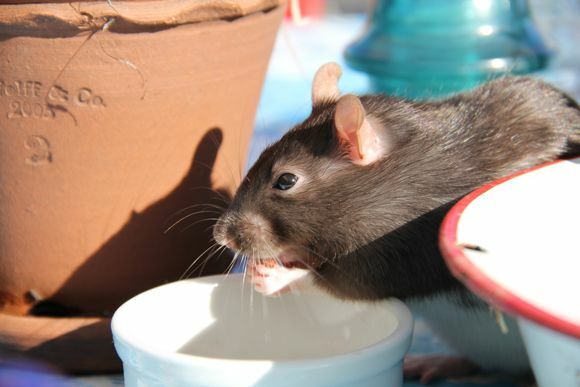 We brought her dish, with something for refreshment. She selected a favored tidbit. Weazie is dainty. 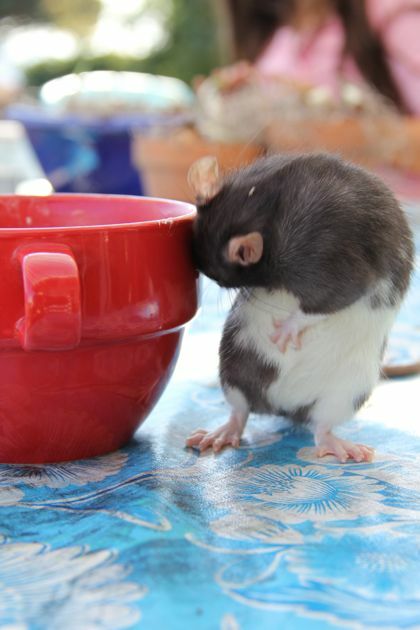 She eats slowly, mindfully. Perhaps she is French? She does seem to dine with a Parisian's air of refinement, and savoir faire. In the meantime, Maria was tucking in the bulbs with some moss. She and I talked about the eager bulbs that had already begun to sprout, and how happy they would be to straighten up, now that they could reach the light. Pardon me for interrupting, Weazie interjected. Is this something I may try? Weazie helped herself. 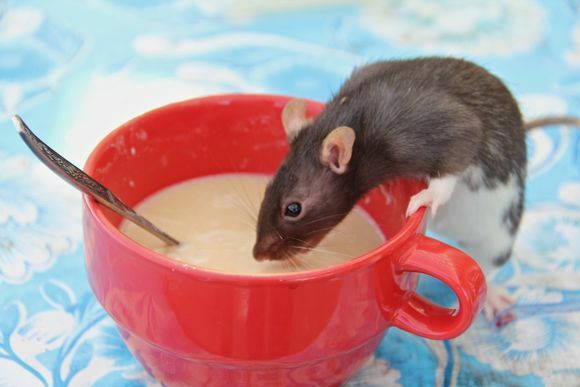 She takes chai with a bit of milk, and lightly sweetened, thank you. The Mountweazels, purveyors of fine teas and exotic spices, came to this land aboard great sea vessels, where in the cargo hold they would brew a great many cups of tea to sustain themselves on the long voyage, and she licked her lip contentedly. And now a cleaning. No cream on the whiskers, please. Right, and left... until she was suitably clean. Oh, I was just thinking, she seems to reply, How lovely it is to garden with friends, to share diversions, and nourishment, and to reflect on the joys of anticipation. Flowers and Christmas, holidays and friends. It makes my heart glad. Me too, Weazie. Me too. 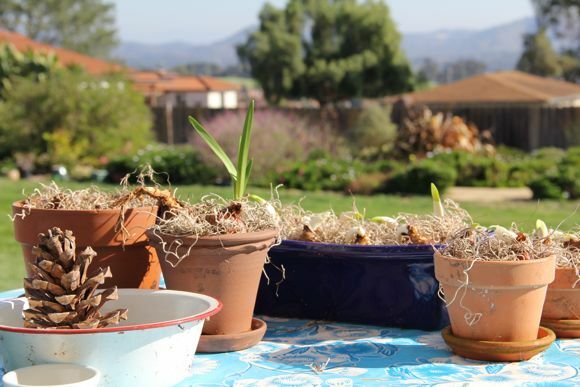 All the bulbs in pots, snug in the earth, facing the sun. Our work and play are done. 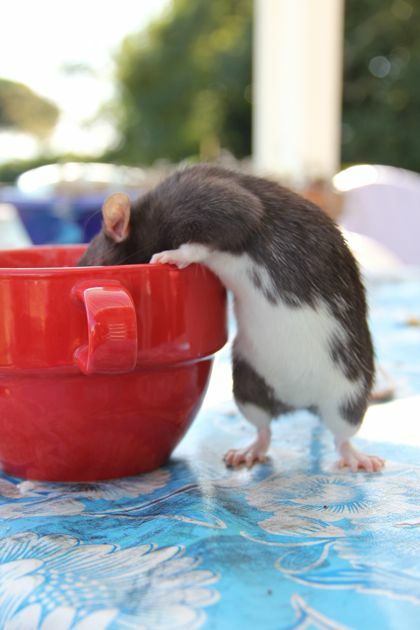 Oh, those tea cup photos are delightful. 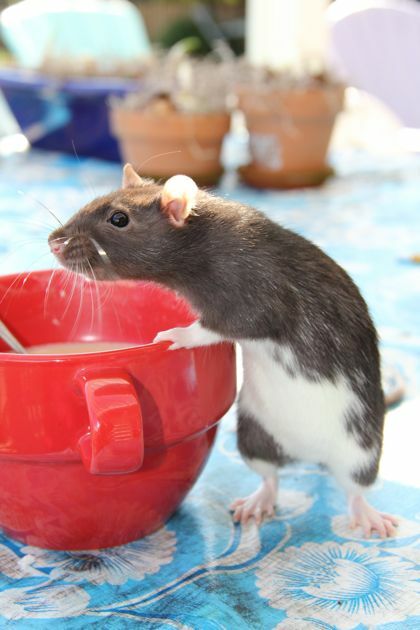 Makes me want to get a rat. And have a cup of tea. Yay! Miss Mountweazel does have the most wonderful manners, I must say. A credit to her kind. So lovely to make her acquaintance. 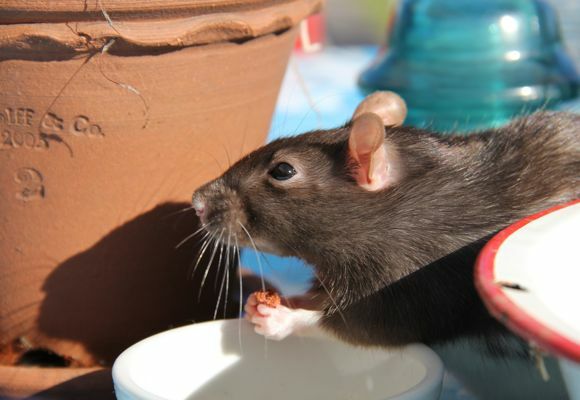 My sister had a rat as a pet after I left home and it was a wonderful little creature. 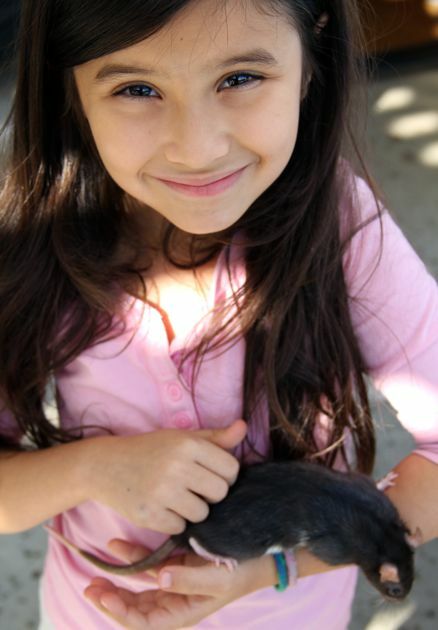 Weazie looks just like her! I do have to be honest and tell you I'm finding the little guy rather cute. 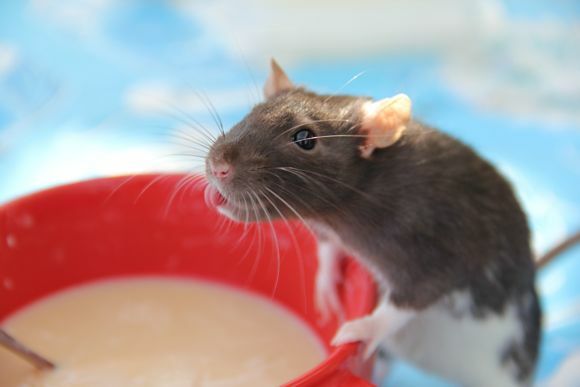 You've opened my eyes to taking a new look at rats...he's seems to be a fine little friend for you. Enjoy the holiday - I hope you'll get a very special surprise this year! She's so cute! You're not afraid she will run away? How delightful to have such a helpful little pet! This entire post is completely charming!! I've been swept off my feet! 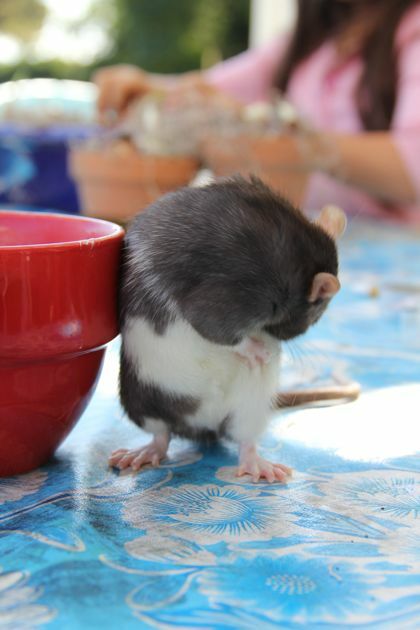 Weazie is a refined, well-mannered little rat. This is an adorable story. Has Disney called you yet? How about Golden Books? You really need to publish a children's book starring Weazie. Instead of cutesy drawings you could use the real thing - your photographs. You're a natural. I think you just found the way to making money off your blog. All these sweet, fun comments. Thank you. Just dropped by, thinking of our dear Weazie. I miss her, terribly much. my eyes sting. She was one of a kind.